The Apple PowerBook was one of the most revolutionary computers ever made. It changed the way people used computers. It was highly portable and lightweight, but functioned as effectively as a desktop. We call them laptops today, and many users never leave home without one. 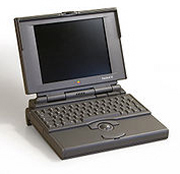 The original PowerBook series—the 140 and 170—were designed by Robert Brunner, IDSA; Gavin Ivester, IDSA; Suzanne Pierce; Jim Halicho; and Eric Takahashi of Apple Computer; Michael Antonczak of Indesign; and Matt Barthelemy of Lunar Design for Apple Computer, Inc. The design featured a compact dark grey case with a trackball instead of a mouse. The forward keyboard was innovative, leaving room for palm rests for the user. Power was 16 MHz on the 140, which had a passive-matrix 1 bit screen, and 25 MHz on the 170 with a 1 bit active matrix screen. The design was very successful, capturing 40% of the laptop market. In 2000, IDSA named it a “Design of the Decade.” PowerBooks were upgraded and improved frequently over the years until 2006, when they were essentially replaced by the MacBook Pro. The final PowerBook was a 12-inch, 1.5 GHz G4.